Bali Spa Going o towards Jimbaran beach from the bypass road to a narrow street leads you to a spa opened on October in 2011, Royal Balinese Spa. Their reasonable prices and the 30 treatment rooms have caught many repeaters! You don’t want to miss the 2 hours package which becomes more reasonable with our Driver Service and Half Day Package including light meal! No. 1 Menu!!! The Reasonable Package including Shirodara! Chilaren can wait in the treatment roo. Kids Menus for children age 6 - 13 are available. I really expected the atmosphere, and massage for stiffness from shoulder to waist was just simply round trip. The massage force was weak. 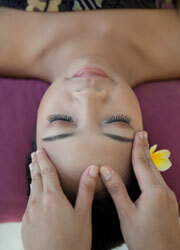 I don’t know the weak massage force is Balinese massage characteristic? Next time I think I also want to try shiatsu.